This post was going to be all about how we’ve barely even broken the rules (other than on 2 or 3 occasions) since ending our pledge….and then today my husband went to Subway for lunch. Yep Subway, as in the fast food restaurant that specializes in deli meat from who knows where? I have to admit I cringed when he told me this because I can’t say I was ever a big fan even before our real food pledge. He is out-of-town on business of course, and was both hungry and short on time (what else is new with his biz trips?). I guess since our pledge was over I thought I was off the hook for having to pack him food to bring along, but today I very much regretted that I didn’t do it anyway. While he was off chowing down on a fast-food sandwich I was at home relishing every last bite of a super yummy “roll up”. 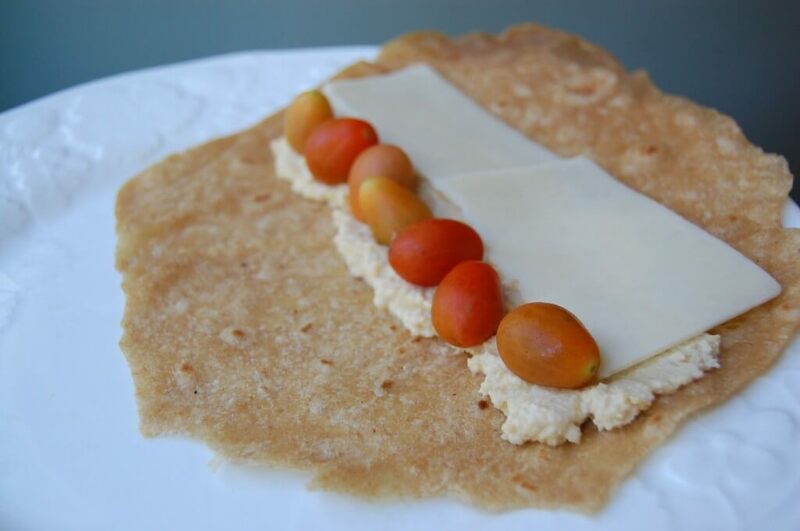 I have come to be a little bit obsessed with these homemade whole-wheat tortillas and wrapping up everything I can in them (pictured is homemade hummus, cheddar cheese, and some local tomatoes). See the thing is…our real food pledge actually kind of spoiled us. When you eat wholesome, nutritious, flavorful, real food day in and day out you come to love it and want it (and expect it) for just about every meal. And eating real food all of the time can often make the other stuff taste pretty bad. My husband of course survived his little lunch escapade today, but to quote him he said “It was not good, but it was not disgusting”. I think I’ll pass on that. So as it is turning out, at times, I am finding this post pledge transition to be even harder than the pledge itself. I feel like I am somewhere in “no man’s land” between following a definitive set of rules and now not knowing what we should do for each and every situation. For example, prior to our pledge I was a HUGE chocolate lover so I naturally bought a bar of dark chocolate the other day. It is still sitting in my pantry…UNopened. I promise you that this is an incredibly strange sight in our house. That bar wouldn’t have lasted more than 2 days in my “prior life”. I also tried buying some marshmallows that I thought our daughters could roast over our new fire pit…and I couldn’t even do it! I put them back on the shelf before leaving the store. Trust me when I tell you that this is very odd behavior for the “me” that I have known for 33 years prior to the last 3 months. I went from having clear direction, goals, purpose (during our food pledge), to now not even having a clue as to what I am doing. My daughters will ask me if “they can have….” and I hate that I honestly don’t know if I should say yes or no. I truly had no idea that this part would be so hard. Maybe we should work on some “new rules” to use as family guidelines going forward or something. Just so we can be consistent on how often (and if and when) we eat the junk. And since this is (as always) an honest account of our journey I should also mention the other side of me in all of this. I must admit that I am sometimes slightly envious of all the people standing eating the junk so carefree. Oh, how I love to feel carefree…about anything really. It may sound a little strange, but I occasionally miss the “old me” who with no conscience whatsoever would have truly enjoyed a piece of cake at a party, or a few bites of chocolate, or a white chocolate mocha, or some homemade chocolate chip cookies. This really is a difficult world we live in to constantly (and I mean constantly) be around all of this stuff. And I know that it would absolutely still be okay for us to indulge in these types of things again on occasion…I just never new it would be so hard for me to take the initial plunge back in! If any other real food eaters have any advice for me out here in “no man’s land” I am all ears! I think it might be helpful to define your goals, so you know what you are aiming at. Are you aiming at never letting sugar cross your lips, or are you aiming to feed your family the most nutritious, least food possible without making an idol out of ‘health’ food? Is it right for you to have treats in moderation – on special occasions, like Grandpa’s 90th birthday, or a candy cane in the Christmas stocking, say- or is it something you feel strongly you need to eliminate completely? and then, just do your best. You don’t have perfectly adhere to every guideline in order to improve your family’s health and happiness. I definitely this you should define some rules and go over them with your girls, just like you did with the 100-day pledge. That will eliminate confusion and frustration on everyone’s part. If they know they can have only one “junk food” a week (or whatever you determine), then they (hopefully) won’t ask you about it as much. Also, I really do hope you can find your balance. Feeling guilty or nervous about food all of the time is no way to live. There’s so much good in life to focus and dwell on – I look forward to seeing how you eventually regain your carefree attitude while still eating consciously. I’m agreeing with the others that defining the goals is the best way to live in a “normal” world (i.e. the one where your kids are given cupcakes without your knowledge, etc) without too much hassle. For instance, my personal rule about eating sugar is that I have to REALLY REALLY enjoy what I’m about to eat, and even if I’m one bite into something I expected to like, if I don’t like it, I don’t eat it. For an example, I went to a bakery for lunch yesterday with coworkers (they serve sandwiches) and on the way out one of my coworkers was treating us to dessert. I saw some huge chocolate cupcakes that looked good, but I decided to try the mini one with ganache as frosting instead – just one. Turns out the thing was AMAZINGLY delicious, and I enjoyed every last bite of it. Much better than indulging in the birthday cake bought for the office from Costco that I really don’t even like, ya know?! So I don’t eat much sugar, but when I do, I enjoy the hell out of it and it sticks with me as a really nice, but not overindulgent experience. And I know that if I ate that yesterday, I’m probably not going to indulge the rest of the week in a sugary treat – but even if I did, I shouldn’t feel bad about it. I think the main thing that drives my “rule breaking” (that is, avoiding processed foods) is when I’m in situations that it would be difficult or burdensome (on others, not myself) to be really picky. If someone invites me over for dinner and has already gone out of the way to make my food vegetarian, I’ll probably not care that the bread they served on the side wasn’t whole wheat. The rest of the time – which mostly is in my complete control – I stick to my rules. So even if I do good 80-90% of the time, that’s a lot better than not having any rules at all! My husband and I had a discussion on a similar subject a few weeks ago. We try to eat as clean as possible, but have decided not to go bananas over the whole thing. We have decided to serve our children nutritious foods when it is within our control. We are so blessed that, while they don’t like everything, they eat a wonderful variety of foods. We think it’s important, however, to keep our food preferences mostly within our home, not overly limiting when they are outside of our house. We all want to be “easy” guests that our friends enjoy, rather than the guests that cause anxiety trying to uphold our food values. It’s our personal choice to turn something down, but we don’t expect our children to do so. We simply explain to them the benefits of the “good” foods, and that the special treats are yummy, but serve little purpose. As you yourself has mentioned, when your diet mostly consists of the clean, wholesome foods, your tolerance for anything else is limited. I think it’s important that the drive for nutritious foods come from within our children rather than from a set of hard and fast rules. At ages 6 and 3, they certainly love their junk food, but I think the blueprint for a well-rounded, healthy lifestyle is well established. I should add that I commend you for your pledge. It was truly enlightening to me to read your posts. Your influence has helped me learn more and strive for even better choices! One idea one of my friends gave me….she puts 2 magnets on her fridge (I think they are choc. chip cookies) and each day her little boy (he’s 5) gets 2 “sugars” or “treats” to eat. That way he can choose what he wants to splurge on but she is still limiting his intake. Sometimes I think when we completely deny our kiddos the “treats” it makes them crave them even more and we don’t encourage a healthy relationship with food. Everything in moderation, right? I struggle with the same thing each day….trying to feed my family healthy, nutritious food but how impossible is it to do when our grocery store shelves are loaded with junk? Who was the genius that decided to put the candy right next to the cash register?! No wonder there is an obesity problem in our country! On a side note….I am a teacher and this week the kids at my school are shucking corn during P.E. class(grown from a local organic farmer) and then they are eating it for school lunch the next day! It is a program we are working on called “farm to table.” Love that we are making a difference even if it is in a small way!!!! Love the farm to table school concept. Just awesome. First I want to say THANK YOU for your blog and recipes. My family and I entered this new food consciousness just a few months ago after watching Food Inc. This is a big deal for us. One of my sons has real issues with food texture and has never been able to eat most fruit. And I LOVE my fast food. I live on the road in small town Oklahoma for work and there are never more options than a Subway, local Mexican food joint and McDonalds. It is tough. So, although we never took the full pledge we have defined some rules we got from a book by the fella who did the Food Inc. movie. “Food Rules: an Eater’s Manual” by Michael Pollan. It is full of kitchy saying like “if it comes through the window of your car, it’s not food” or “if a 3rd grader can’t pronounce the ingredient list, it’s not food” or “if your grandmother wouldn’t recognize it as food…” well you get the idea. This has been helpful to my family and to my kids. They can relate to those rules. I often find them counting the ingredient list (no more than 5) and bringing me bad examples of things we used to eat. We eat less meat, and only what I get from a local rancher, more organic whenever possible and buy locally. No more sugar cereals. Only homemade desserts (treat treats like treats is one of the rules) and more grains and nuts than I ever knew existed. Thanks again for your sharing your family’s adventure. It’s been an inspiration to mine! As a natural rebel myself (I hate rules) these have worked for us. Just curious, did your husband think of just getting a veggie sub at Subway? I go there occasionally and get a veggie on wheat with mustard. I think sometimes people forget about all of the veggies they offer – spinach, iceburg lettuce, tomatoes, onions, green pepper, hot peppers, etc. I know it’s not 100% in the rules, but it’s a lot better than the disgusting slimy circles they call “meat”. That is a good point, and I agree it would be better than some of the other fast food alternatives…and you are cracking me up with the “circles called meat” comment! Re. Subway: A friend who has many chemical sensitivities told me that Subway uses a food grade adhesives on their circles called meat to keep the sandwiches together, and that the fresh-baked bread smell in the stores is a chemical fragrance…. That is almost hard to read….it’s a good thing I would never go there in the first place! I will let my husband know the real deal and pack his lunch next time. This is an old comment and I just saw it but I worked at Subway A LONG TIME AGO and bread is baked at the store. It does come frozen but it is baked at the store and that’s where the smell comes from; not from chemicals added to the ventilation system or whatever other stories I’ve heard. Can’t argue with the “quality” of the bread though. A veggie sub is not a totally bad alternative if fast food is your only choice. Get some XYLITOL; a healthy sugar made from birch. (do the research) Melt it in a pot on the stove on about 4 until it is completely clear. I don’t measure, but I’d say try 1 cup. (don’t stir it as it sticks to the spoon) Add some coconut oil, say 2 tablespoons. Then add about 4 – 5 squares of UNSWEETENED baking chocolate. It’ll melt right in there. Now stir it WELL and give it a taste. (careful it’s HOT) If it’s not sweet enough, add a bit of stevia, because if you add more xylitol, it stays in its granular state. Then if you have some almonds chopped or whole, mix them in. Pour out the mixture onto some parchment paper lining a smallish baking pan. Spread out and let cool, then refrigerate. It you want to have some fun, right after you spread the mixture around on the pan, drop some blobs of organic, peanut butter throughout, and as it melts, swirl it around a bit. You can thank me now. I hope you like it, because I live on this stuff. Experiment and adjust your amounts to taste. I just started a low carb diet about 6 weeks ago. I have a sweet tooth and wanted something sweet without it being artificial or processed. I’ve found a rediculous number of recipies for desserts and chocolates that are made with whole food ingredients and sweetners made from xylitol and stevia (both are natural and not processed – but check brands as some do add “other” ingredients). I love the sweetness and a little curbs my craving. Check out “low carb desserts” on Pintrest and you’ll see what I’m saying. Not all the recipies are made with whole foods, but wow there are a lot out there. I’ve even taken a few recipies that are use fake processed sweetners and switched the sweetners out for xylitol or stevia (sometimes a mixture of both) and they turned out great. I did a 3-week cleanse in the Spring that really changed my palate. It was nothing extraordinary, but pure, simple foods, no wheat/dairy/sugar/processed foods/alcohol- pretty much the basics. It reminded me of what Michael Pollan says: if your great-grandmother wouldn’t recognize it, don’t eat it. I was amazed at the results, and how my CRAVINGS fully subsided for “bad” foods. I simply didn’t want sugar, or heavily-processed foods. I slept better, was in a wonderful mood, & my mind seemed clearer. The flavors of local, natural foods from farmers’ markets & my weekly CSA box were 10x better. Holding on to that change can be a challenge due to convenience, prep, etc, but it’s so worth it.